Finally! My book Why Ayn Rand is Wrong (and Why It Matters) is now available in three major formats: paperback , iBooks (for iPhone or iPad) and Kindle . I'm happy to report that the book continues to increase in sales every month, and retains very high numbers on several of Amazon's lists (#48 in Philosophy, 8 months after publication -- nice!). More than anything else, I'm proud to have written a philosophy book (or a pamphlet, really -- it's only 50 pages long) that is being read by hundreds of new readers every month. I'm humbled to realize that I'm living the philosopher's dream: my ideas about the meaning and limitations of Ayn Rand's ethics are beginning to enter the popular discourse about her legacy. 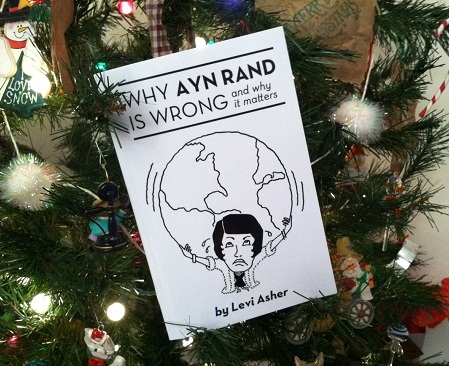 I've gotten a moderately positive response to Why Ayn Rand is Wrong from readers who do not have a lot of familiarity with Ayn Rand or Objectivism, and a strongly negative (but engaged) response from within the Objectivist community. There have been a few bad reviews, and there's a rambunctious dialogue still going on over at my Amazon page . I don't mind seeing negative reviews from serious Objectivists. It means they're reading my book. Give them a few years ... it'll sink in. 1. Vanessa Veselka describes her season in the Amazon factory. 2. How To Become The Most Famous Poet In America Overnight, by Jim Behrle. 3. "Watch my back in a minute when I start talking about people pursuing MFAs and PhDs in poetry and creative writing; please, don’t let them sneak up and stab me with a rolled-up thesis draft they’ve whittled into a shiv ...". Tough-love for the MFA/poetry universe (and some amusing pictures). 4. The nature and future of bookstores has been a hot topic lately. Here's Richard Russo on Amazon's bad bookseller ethics, followed by Farhad Manjoo on why buying books on Amazon is better for authors, the economy, and you. Finally, Three Percent weighs in with Richard Russo, Bookstores and the Amazon Price Check Thing. I generally like the innovations Amazon has brought to book publishing, so I am not among the Amazon-bashers. But of course I dearly love bookstores, and I make a point of buying books in my favorite bookstores to help support their continued existence. I hope others do the same. 5. Meanwhile: Eden Lupucki explains why you should not jump on the self-publishing bandwagon. 6. Steve Almond explains why he is going ahead and self-publishing anyway. 7. Finally ... Peter Winkler has to work harder to write his book than most writers I know, but that didn't stop him from turning out a major biography of Dennis Hopper . 10 Responses to "The Bookselling Life"
impact on my thinking than I would have believed when I first encountered it 25 years ago. said rational self-interest should be the starting point, not that it necessarily was. self-interest where there was none. He gave free reign to the James Taggarts of the financial world, and given Ayn Rand's thesis, shock at the results is the last thing he should feel. Do you know of any other sources I could find for serious analysis of the Objectivist ethic? 1) Well, I think it helps to speak of two forms of egoism, as the Stanford Encyclopedia of Philosophy does. Psychological egoism is the belief that humans are motivated only by individual self-interest. Ethical egoism is the belief that humans should be only motivated by individual self-interest. Psychological egoism is a theory about what is, while ethical egoism is a prescription for what should be. As far as I can tell, Ayn Rand takes psychological egoism for granted, and her entire ethical philosophy amounts to a defense of ethical egoism. She explains -- very convincingly and colorfully -- how people and societies harm themselves by attempting to be altruistic. But the key point of my book is that she never explores the question of psychological egoism at all. Nowhere in her entire body of work does she defend the thesis that all humans are naturally self-interested. Instead, she drills home the point over and over that ethical altruism harms individual self-interest. But she never admits the possibility that we may innately care about each others in exactly the same way that we care about ourselves. She accepts as if on faith the belief that any person's interest in any other person is derived from self-interest, and in fact this is a false premise. So, I think your question is a very apt one -- it shows me that you understand the point of my book. You ask if I'm sure that egoism is being used (by Ayn Rand, I presume) the way I say it is. Well, I pored through every one of her essays on ethics that I could find (I can't claim to have read everything she wrote, but I read the most representative pieces) and never found anything to contradict my conclusion. If you find anything that might show otherwise, please let me know. 2. Regarding Alan Greenspan, I do agree that the influence between Rand and Greenspan is more circumstantial (though the two had a close mentor/student relationship) than direct. You are absolutely right that, as chairman of the Federal Reserve Board, he acted in many ways that could have never passed an Ayn Rand litmus test. But then, what businessperson ever acts wholly according to a strict philosophy? I think the connection between Rand and Greenspan was strong enough to bear examination, but I would be overreaching if I tried to build my critique of Ayn Rand upon a critique of Alan Greenspan. And I didn't. As I'm sure you noticed, Greenspan is only mentioned as an interesting aside in my book, and is not part of my primary evaluation of Ayn Rand's arguments. (Note: it's equally interesting, and even more relevant today, to consider how current politicians like Paul Ryan are also using Ayn Rand's ideas, also in ways that wouldn't pass the Ayn Rand litmus test, even when her influence is clear). Thanks for noticing the story. I'm enjoying exploring your blog. Vanessa Veselka is a fantastic writer. Thanks for the link to her article about Amazon.com business. I love the line, "they followed their bliss out the door." Nice to hear from you, Peter Winkler -- you're welcome! I haven't read your biography yet, but you sure have picked a good subject. Fair enough. I hadn't specifically noticed psychological egoism (apart from Ayn Rand's personal egoism) in the novels, but then I wasn't looking for it, and my acquaintance with her essays is twenty plus years old. I am renewing that acquaintance as part of my own research. Is it possible that I missed the point? In retrospect, and in view of your feedback, it may be that the actual price of admission to John Galt's club was the complete denial of anything other than "self" as a legitimate motivation for any action. The second point bears more directly on my research. I have noticed a rather broad scectrum of people grabbing at bits and pieces of Rand's thesis without any true understanding of her point, and trying, as Mr. Greenspan did, to make part of a theory work in reality as well as Rand managed to make the whole theory work in fiction--while at the same time refusing to recognize the fact that it was fiction. It does help. after all, to have complete control of both sides of the argument. Nice to hear this, Levi. To be honest, my engagement with Rand pretty much ended with trying to read her in high school, and deciding “this is boring/stupid.” So I’ll be an easy target for a rebuttal to her thinking, but I plan to read it anyway. On a related note, I use Amazon all the time without any guilt, but Lord Almighty, that Manjoo article made me want to bash my head in. Like so many Slate pieces, it proposes an interestingly counterintuitive thesis, only to end up with a poorly-thought-out string of anecdotal complaints and tautologies. He begins by arguing that indie bookstores deserve to go out of business because they’re not as cheap as Amazon. (An argument which, if taken to its logical conclusion, would also mean that Amazon deserves to kill off all indie record stores too – who can’t sell Lady Gaga CDs for a buck as loss leaders, like Amazon does – and then, I suppose, that Amazon deserves to be killed off in turn by pirate sites who charge nothing for the product that Amazon charges a bargain price for.) But his primary complaint seems to be that he doesn’t like the selection/staff at his local indie bookstore. Thanks dude, that’s enlightening. "Why Ann Rand is Wrong"...now that is a provocative title...if I remember right from reading Atlas Shrugged and The Fountainhead-Rand's philosophy centered around individualism and collectivism...fitting for today' world. The political structure not are at war based on the lowly individual versus the mighty corporations....I will read you book.